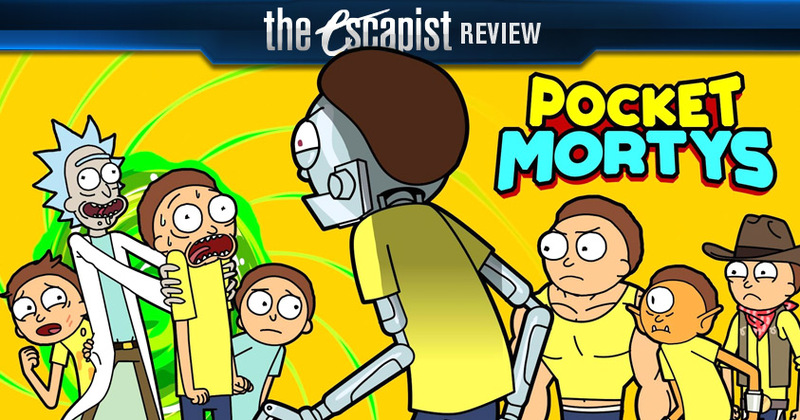 Pocket Mortys Review - We Gotta Catch 'Em All Morty! Pocket Mortys is available for free on Android and iOS and released on January 13th. This review was conducted on an iPhone 6. In a universe not unlike our own, Mad Scientist Rick Sanchez takes his grandson, Morty, on intergalactic, interdimensional adventures of utmost importance (and debauchery). However, a Rick from an alternate universe invades, and using his own remote controlled Morty, engages the two in turn-based combat. After some odd convincing, Rick uses his own Morty to battle his alternate self. This system is the initial premise of Pocket Mortys, a free, mobile Pokemonesque adventure and monster battler based on the hit Adult Swim show Rick and Morty. After defeating evil Rick, in order to figure out what exactly is going on, Rick uses his portal gun to transport himself and Morty to the Citadel of Ricks, the home of the Council of Ricks, the governing body that controls all of the Ricks and Mortys in every dimension. 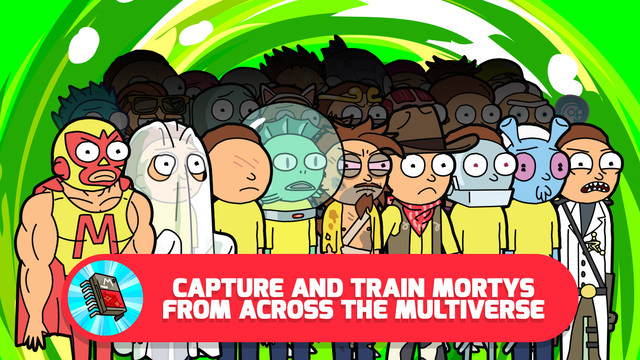 Upon their arrival to the Citadel, Rick discovers that "trainers" throughout the galaxy have begun collecting Mortys and battling them for sport. After discussing this problem with the council of Ricks, Rick has his portal gun taken away until he can prove himself as a formidable Morty trainer. Battles are turn-based and take place in a screen separate from the rest of the game, similar to the older Final Fantasy games. 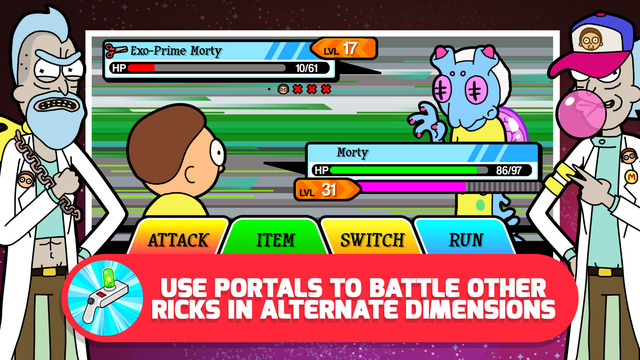 The player has the option to attack, use an item, or run (which is only available during battles against Mortys without a trainer). The Citadel of Ricks acts as the hub world of the game, with various shops, kiosks for crafting items, Blitz and Chitz machines for winning items and new Mortys, and even a Morty day care and breeding center. In the top half of the hub world is the building for the Council of Ricks where players fight their Mortys against the council in order to win back Rick's portal gun. This council acts as the "Elite Four," which players face throughout the game, rather than at the end. The game is completely voiced by by cast members such as Justin Roiland and Dan Harmon and has the same writing talent that fans of the show have come to know and love. Nearly all characters from the show also make an appearance, such as Morty's father Jerry (who is also a Morty trainer), alternate universe versions of Rick, and the fan favorite, Bird Person. Each of the 82 Mortys is imaginative and humorous, with even wilder versions becoming available through the "Combine" feature available through the Morty Day Care. This feature is similar to the breeding feature in Pokemon daycares and allows players to create more powerful versions from their less evolved Mortys. In terms of visuals, Pocket Mortys leaves nothing to be desired, the game takes every familiar character and location from the show and pixelates them in a way comparable to modern Pokemon games. In order to train your Mortys in preparation for the Council of Ricks, Rick must use the portal at the bottom of the hub world, which takes him to a dimension world. Each of these dimension worlds act as routes do in traditional Pokemon games. 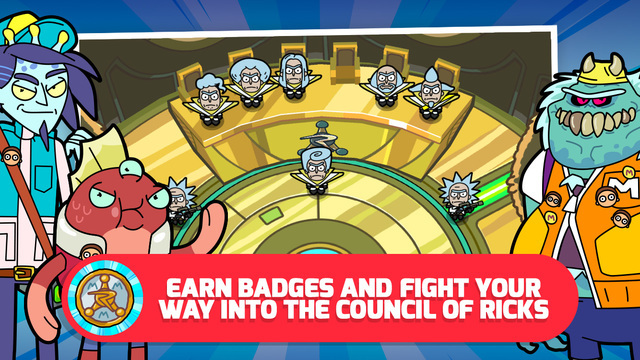 Within these levels you will battle other Morty trainers and capture wild Mortys to add to your party. Instead of having the typical fire/water/earth/air types, Mortys are one of three types - rock, paper, or scissors. Rock type Mortys are stronger against scissor Mortys, scissor Mortys are stronger than paper, and so on. At the end of each world there is a "Boss Rick," the strongest Morty trainer within that specific dimension. These Ricks act as the "gym leaders" of each world and will award you with a badge if they are defeated. The use of Portal Worlds, rather than a large interwoven world, makes the scope of the game feel small. Each one has a multitude of trainers, hidden items, and item crafting kiosks, but the charm of alternate worlds from the show, with their own dangerous monsters and strange cultures, is ultimately missing. This hurts the experience, as I didn't feel like I was really going on an adventure with Rick and Morty because the worlds quickly became a chore rather than an epic quest to become the best Morty Trainer there ever was. After every Boss Rick is defeated, players can return to the hub world or continue training against the Morty trainers and capturing wild Mortys. In the beginning of the game, however, having the items necessary to stay within these worlds is difficult due to the abnormally small amount of prize money obtained from early trainers. In order to keep your Mortys intact, Rick must either take them to the Morty center to heal them or use items to replenish their HP and AP. Although no individual battle is overly difficult, continuing to battle can often be difficult without the proper funds. This initial difficulty almost turned me away from the game, but ultimately, I fought through a sea of Mortys until I was strong enough. There is also the option to earn money by watching advertisements within the game. I have played several "Freemium" games over the years, and this was one of the least intrusive ways I have witnessed advertising within a game. Players can watch 20-30 second videos from the sponsors of the game that will give players quick cash if they are short. 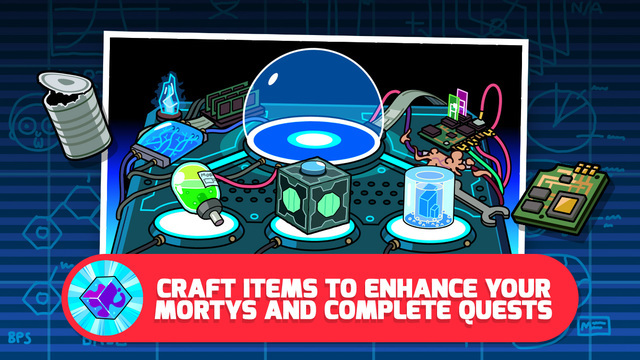 Players also have the ability to "win" Mortys and special items from Blitz and Chitz machines with special coupons. These coupons are very rare, but can be bought with real world currency, although those purchases are unnecessary, as all Mortys are still available in the wild. One major complaint I had about the game was its lack of useful items, or the money to buy those items. I would often avoid battles to conserve health and money so that I would be in good shape for the boss Rick. This could have been remedied by there being more item drops or a higher prize money amount after battles. Most worlds and battle sessions can be defeated in 10-15 minutes, meaning that this game is a good go-to for those tedious morning commutes or breaks at work but will lose your interest over long play sessions. In small doses, this game is exactly what it needs to be, and I don't think anyone can complain about that. Despite this, Pocket Mortys does have longevity, with well over ten hours of Morty Battling before players reach the end game challenges of catching all the Mortys and, for the perfectionist, leveling them to 100, a task for only those who will become the best there ever was. Bottom Line: If you can overlook the early game difficulty, Pocket Mortys is a freemium game that is never in your face about taking your money. With short rounds of gameplay and a lot of post-game activities, Pocket Mortys is well worth a download if you enjoy Pokemon and are slowing wasting away while waiting for the third season of Rick and Morty. Recommendation: If you like Games that are Free, Rick and Morty, and Pokemon games, this game is for you. Wubba Lubba Dub Dub my Glip Glops!